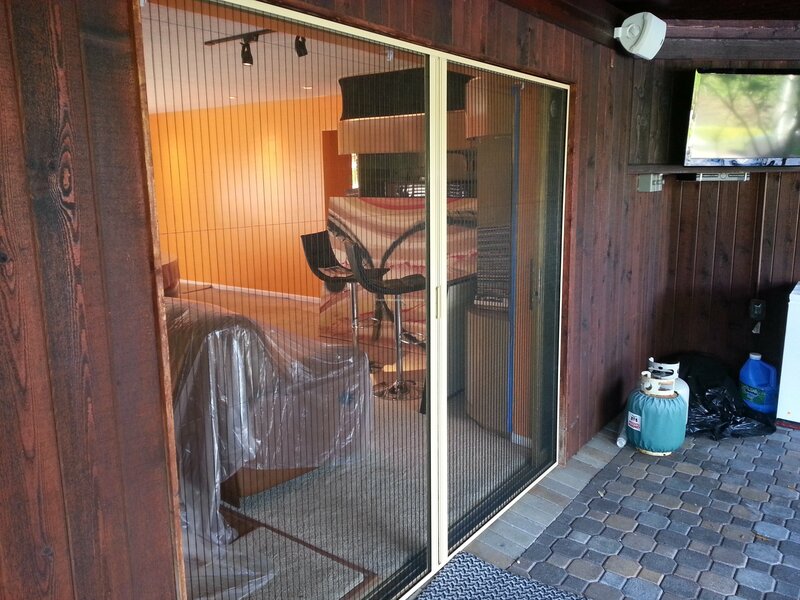 Check out our most recent Hunter Douglas installation of their Vertiglide product. 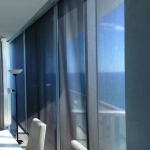 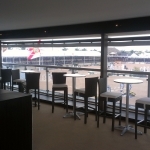 With it you can use either their Duette or Applause fabrics which are available in both light filtered and blackout. 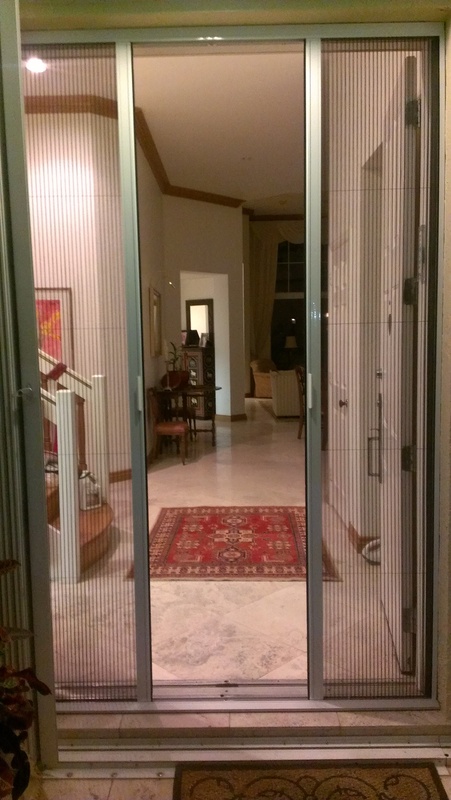 This highly flexible system is great for sliding glass doors or room dividers since they give ultimate privacy when needed. 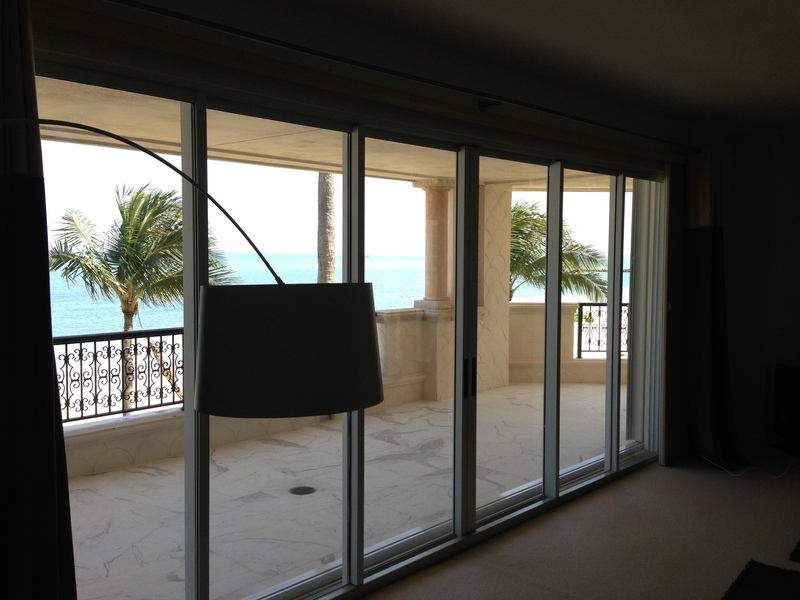 Below you will find pictures of a newly installed Vertiglide system we installed for a client on Fisher Island. 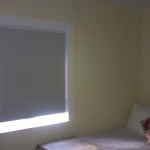 As you can see from the photos they chose a blackout fabric for the bedroom so the early morning sunrise wouldn’t bother them if they wanted to sleep in. 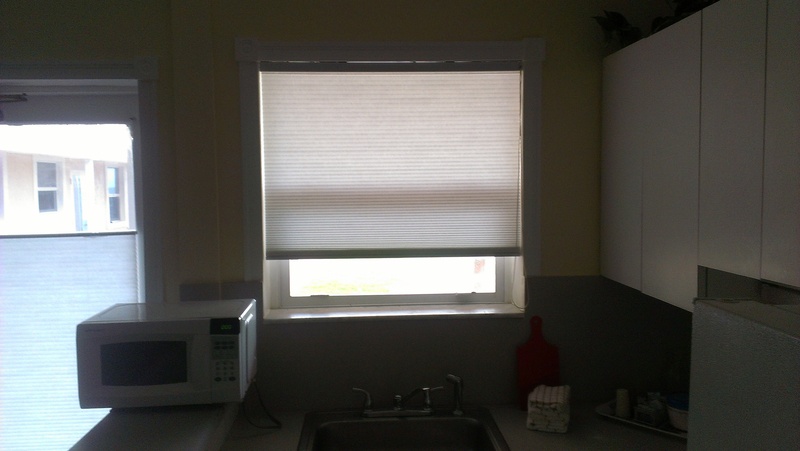 This product is also incredibly child and pet friendly since no cords, chains, or wands are necessary, and a great alternative to draperies. 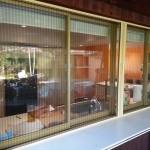 Being a Hunter Douglas Priority Dealer allows us access to many of the fabrics and operating systems you cannot find anywhere else. 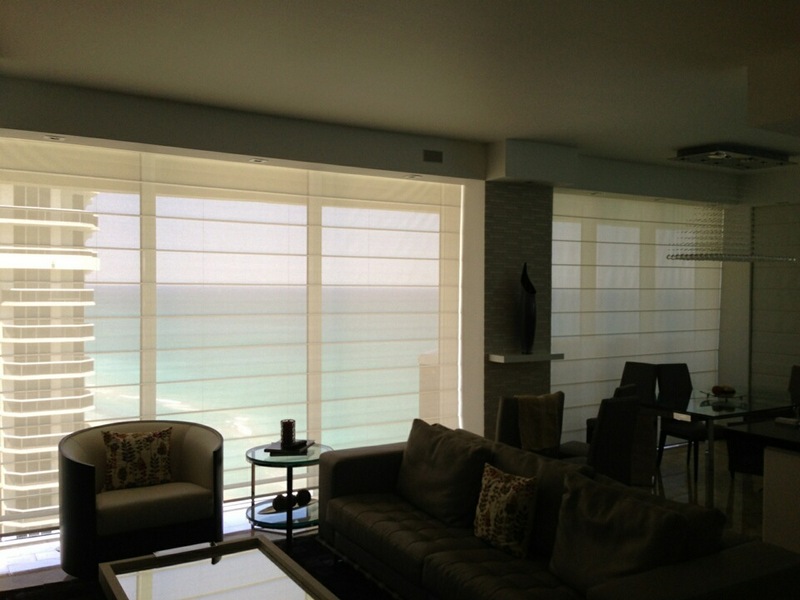 Contact us today for a free estimate and see how Hunter Douglas products can change the way you see the world. 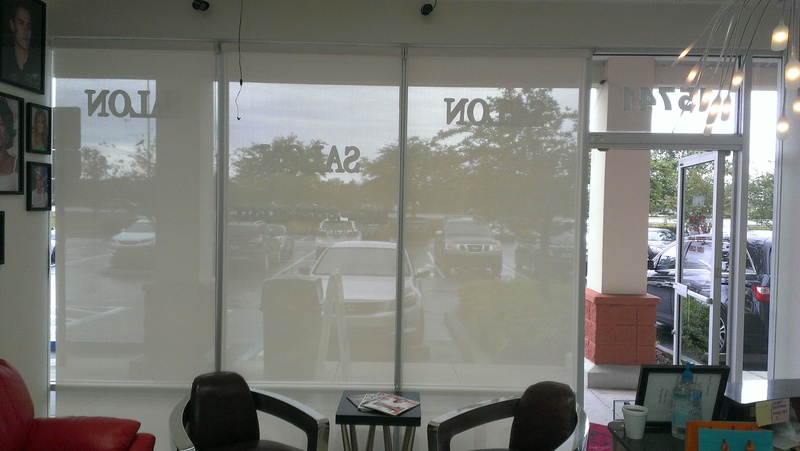 With Roller Shades being all the rage we thought it would be a good idea to help explain the differences between all the fabrics and their opacity percentages. 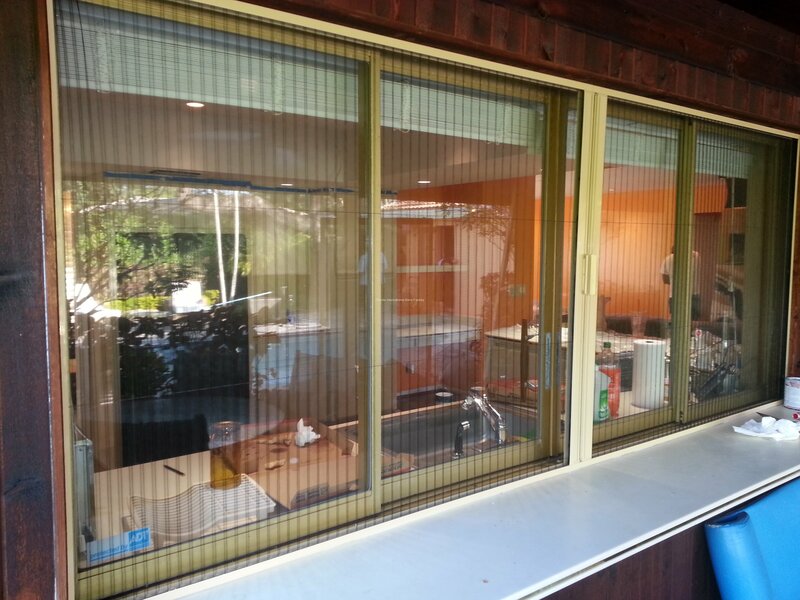 This way our clients will have a better idea of what would suit the needs most in their home or office. 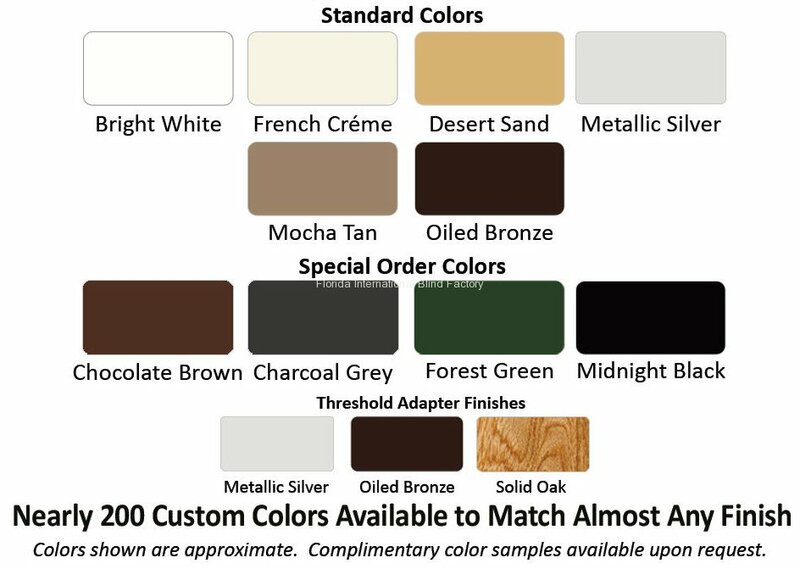 Obviously the color you choose is important when it comes to matching decor and interior styles, but what you really have to take into consideration is the opacity levels of the fabric. 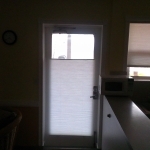 What we mean by opacity is how much light can pass through the material. 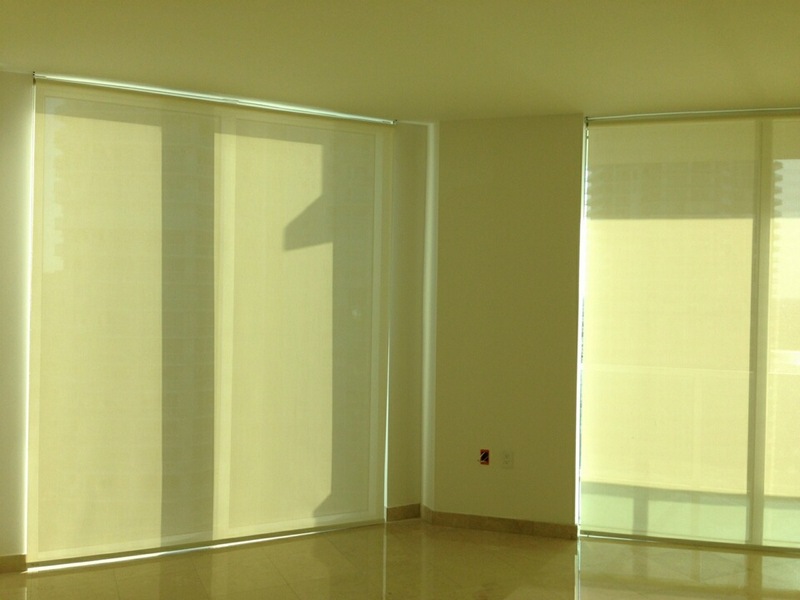 For example, we have light filtered fabrics that can allow anywhere from 0% to 20% of light to show through. 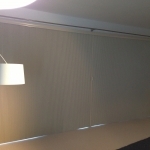 Zero percent(0%) fabric will mean that absolutely no light will pass through the fabric from a light source. 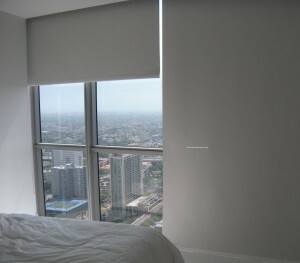 It is what we call our blackout shades and they are perfect for bedrooms or areas that require absolute darkness. 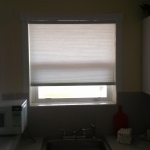 Blackout shades are usually combined with side-rails, bottom-rail felt, and fascias in order to guarantee no light entering the room. 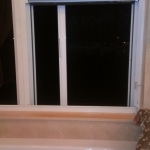 It is pretty much creates a darkroom where if inside and the shades are closed you will not know what time of day it is outside. 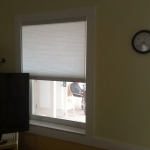 Many of our clients request this type of roller shade motorized so they can operate the blinds from the comfort of their own bed. 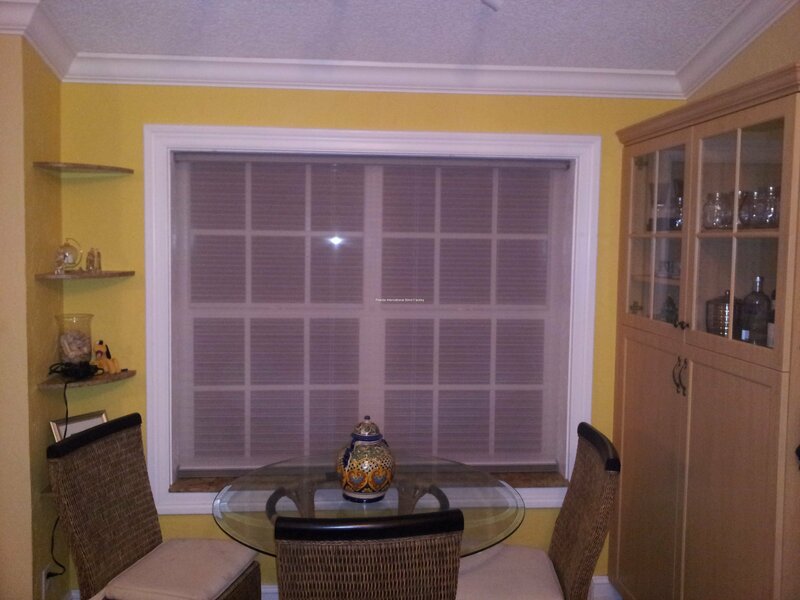 On the other end of the spectrum is our three to twenty percent(3% – 20%) fabrics. 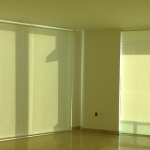 These materials will allow a lot of light to come through the fabric with decreasing percentages lowering the amount of light respectably. 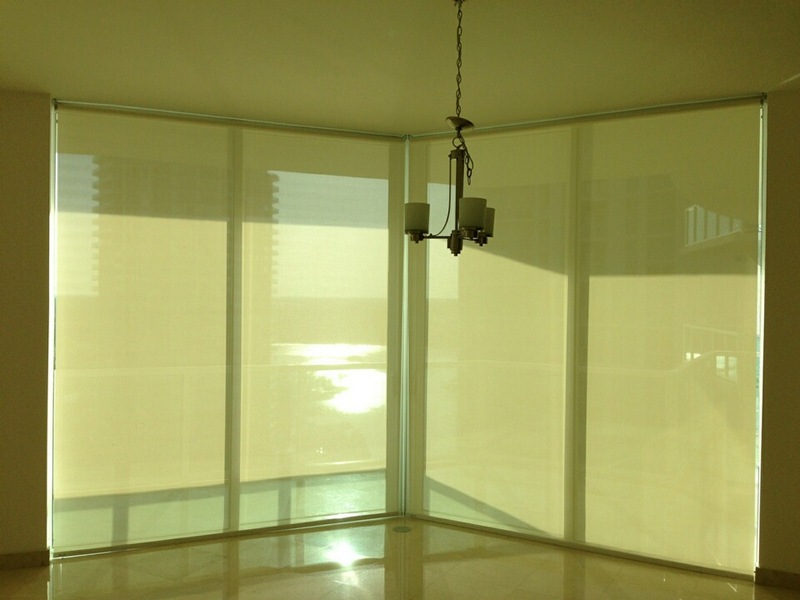 The ability to still see through the fabric while still blocking UV rays is what this material is all about. 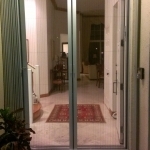 Also, much in the same way a two way mirror will work when you are inside you can easily see out, but if you are in the outside you cannot see in. 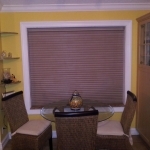 This way they still attain a level of privacy that can not be matched by other types of blinds or shades. 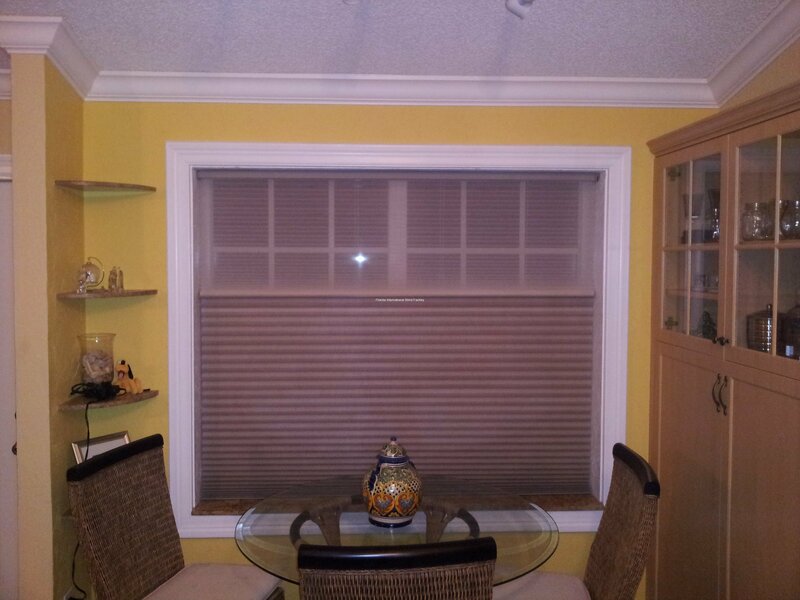 In many cases we have placed both a light filtering fabric and a blackout shade on the same window. 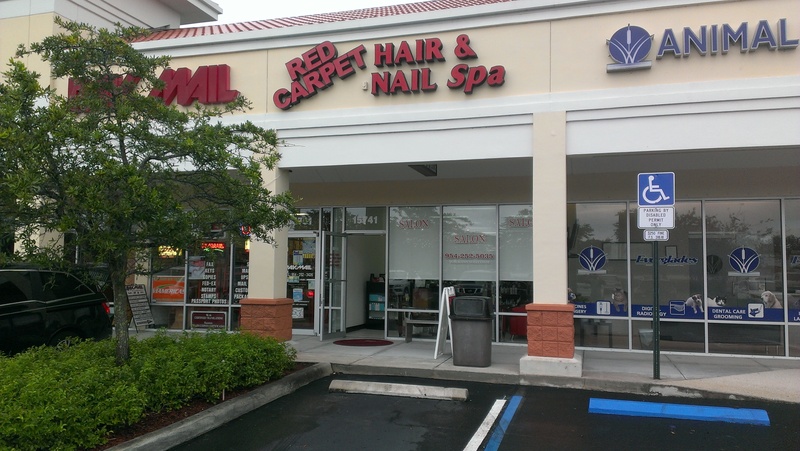 This gives our clients the best of both worlds and takes the difficulty of making a hard decision out of the equation. 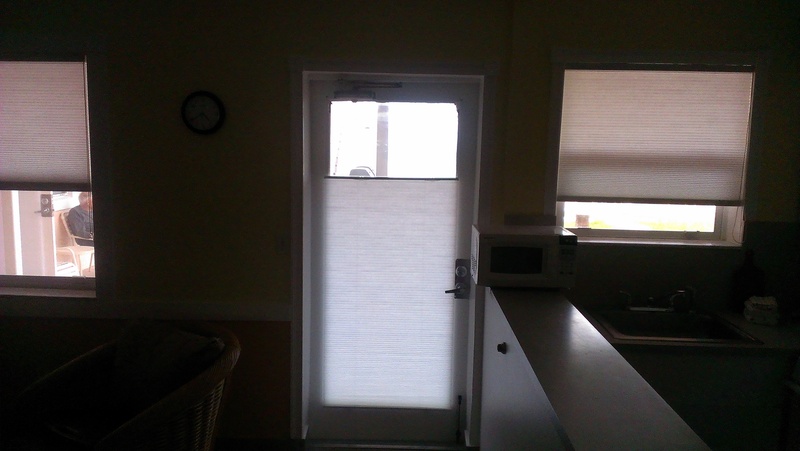 We hope this helps everyone better understand the functionality of this very flexible product and its accompanied fabrics. 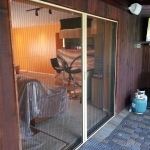 As you can see due to its ability to be customized from just the traditional open and close functions of most blinds and shades has caused it to become very popular among clients in the market for an upgrade. 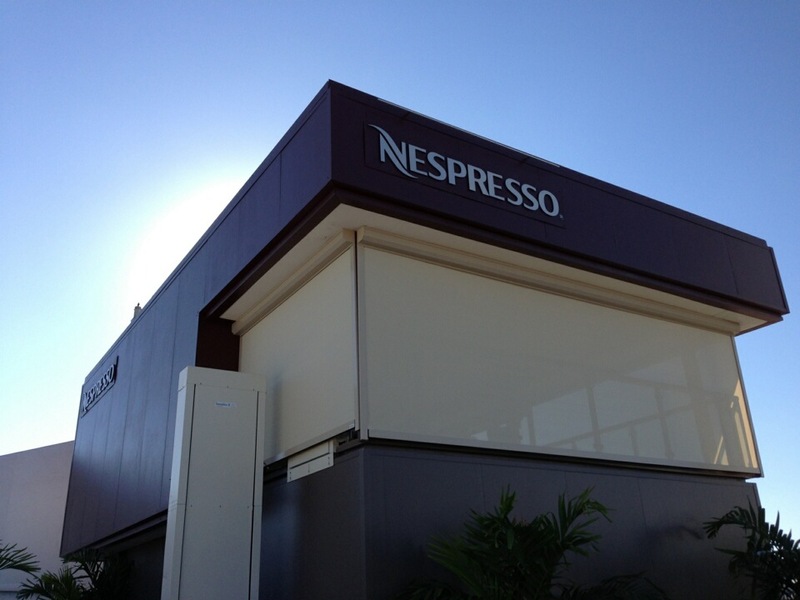 No matter what the opacity they will cut energy costs by keeping areas cool and blocking sunshine. 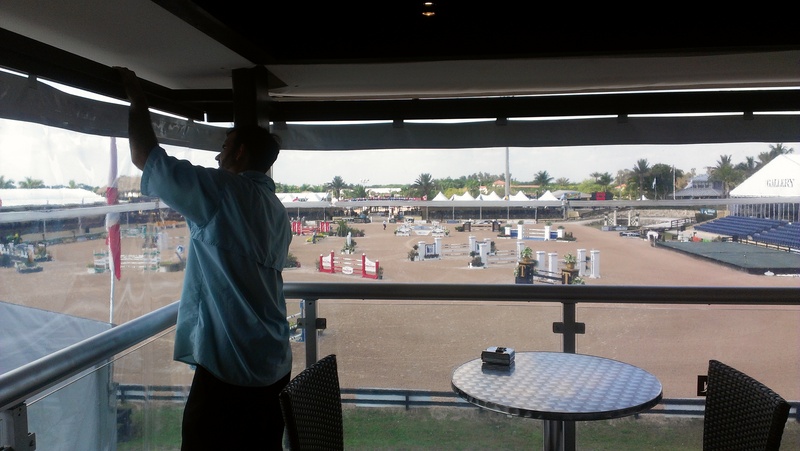 All the different opacity levels also are available in all the different operating systems we offer. 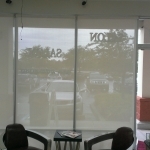 If you have any further questions regarding Roller Shades and their opacity levels please feel free to contact us and we will be happy to answer them for you. 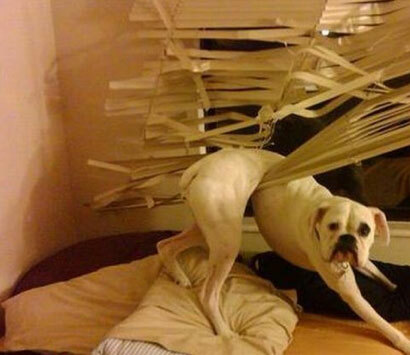 We know there are many pet owners out there who have come home and seen this. 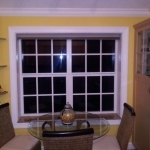 Although it is adorable and cute to the non-owner it can be frustrating and expensive to the homeowner. 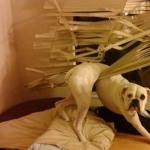 Here at Florida International Blind Factory we can help to fix and repair most blinds and have products available that are durable and more ideal to deal with our rambunctious “children”. 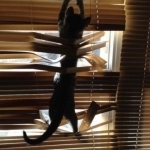 Don’t take it out on them. 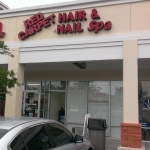 Take it out on one of our salesmen! 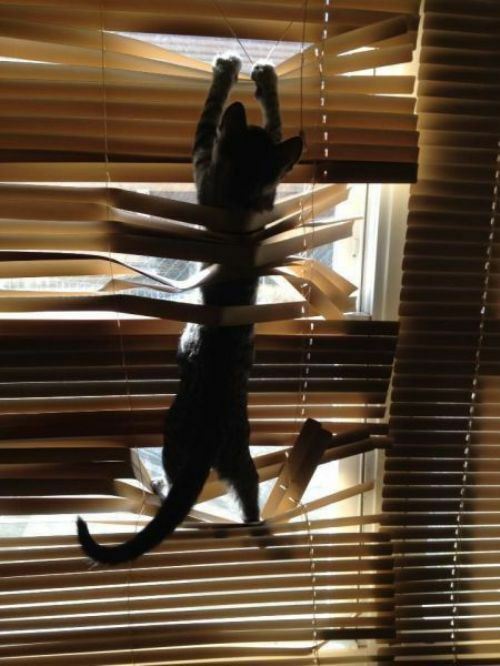 Contact us today to see how we can help you, your pets, and your blinds live in harmony. 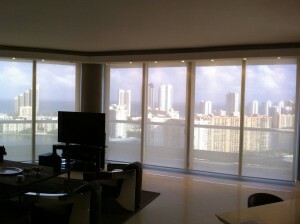 Roller shades and Roman Shades are more popular than ever before, and from the pictures below you can see why. 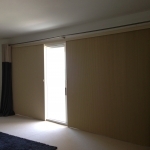 They add a very modern look to any home or office and are highly flexible when it comes to your visibility needs. 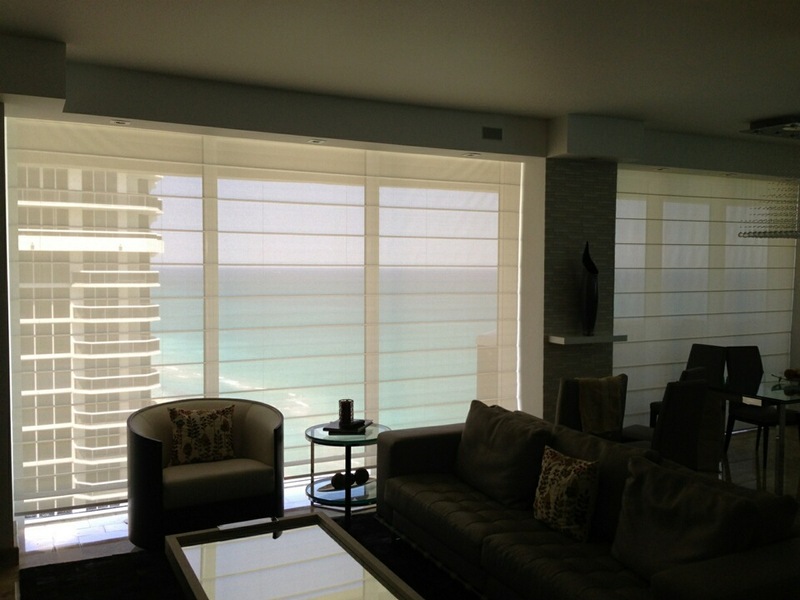 Whether you want a 3%, 5%, 10%, or zero visibility our fabrics can be customized for whatever suit your viewing preferences. 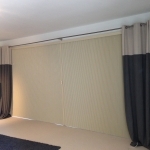 Our blackout fabrics are perfect for bedrooms and can also come with side-rails and fascias to eliminate the possibility of any light entering a room when they are down. 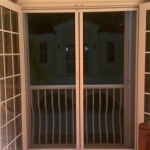 They are also easy to use, maintain, and are available in an assortment of operating systems. 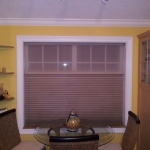 They also come in a variety of colors so they can match any decor or style. 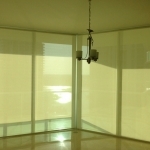 Contact us today for a free estimate on all our Roller Shade and Roman Shade products. 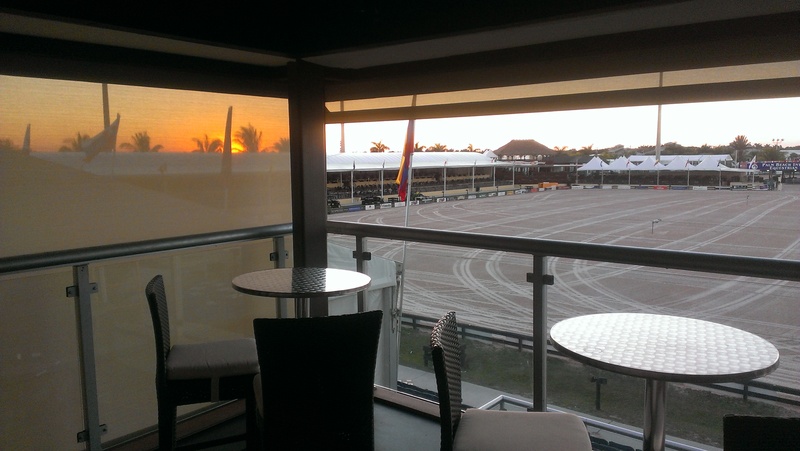 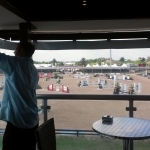 This is our latest finished project for an Equestrian Park in West Palm Beach. 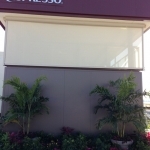 As you can see from the pictures below, what they originally had placed on the exterior of the second story cafe and lounge was large plastic wrap. 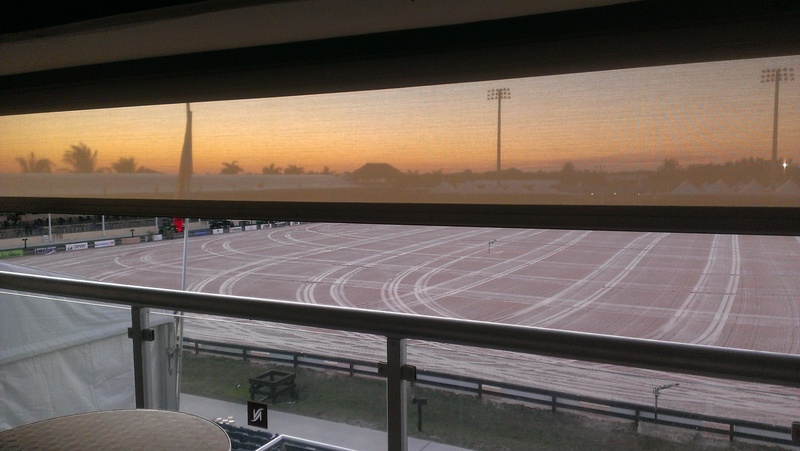 The plastic wrap may have kept the rain and wind out, but because of the inability for the material to breath it got extremely hot and uncomfortable during events. 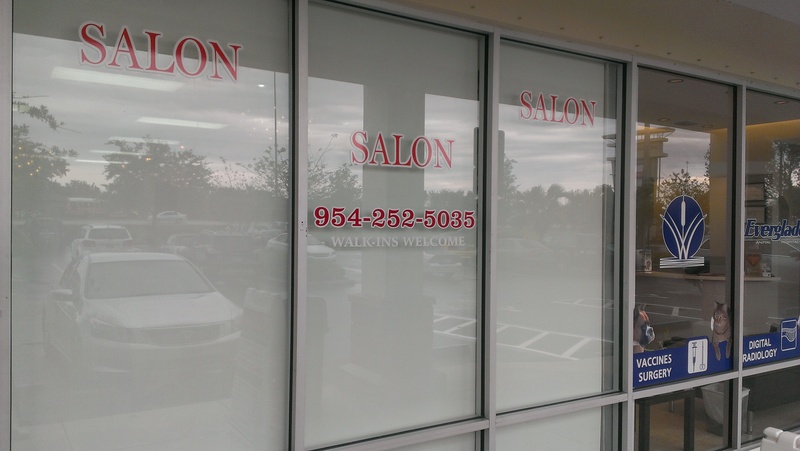 The plastic wrap was also very difficult to remove and caused problems for the patrons and staff when it needed to be removed or put up. 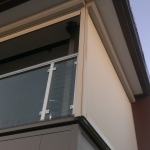 Our strong roller screens were the perfect alternative to such a structure due to their very flexible nature. 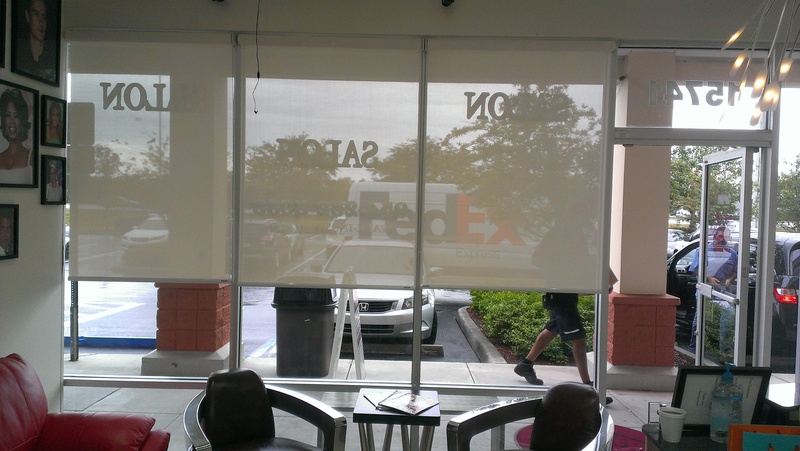 Not only are they easy to roll up and down, but they also protect you from the elements without losing visibility. 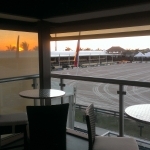 As you can see they add a level of privacy as well since anyone who sits inside may look out, but people sitting outside cannot look in. 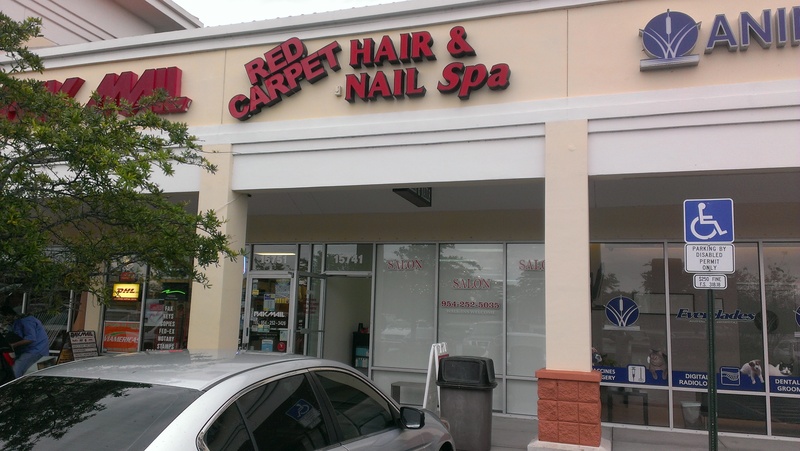 Please contact us today if you think our Roller Screens would be the perfect match for your commercial establishment! 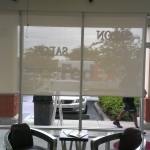 We had the pleasure of replacing a client’s old beat up screens with our new retractable screen products. 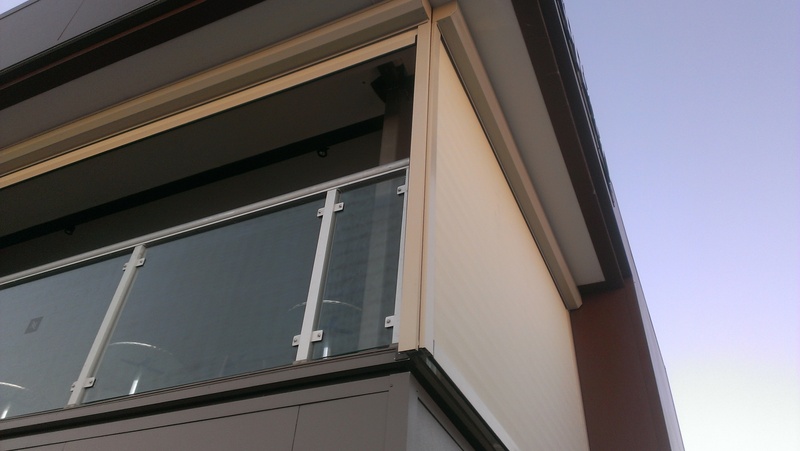 Seen below, we added a center open retractable screen to both their bedroom balcony and their double opening front door. 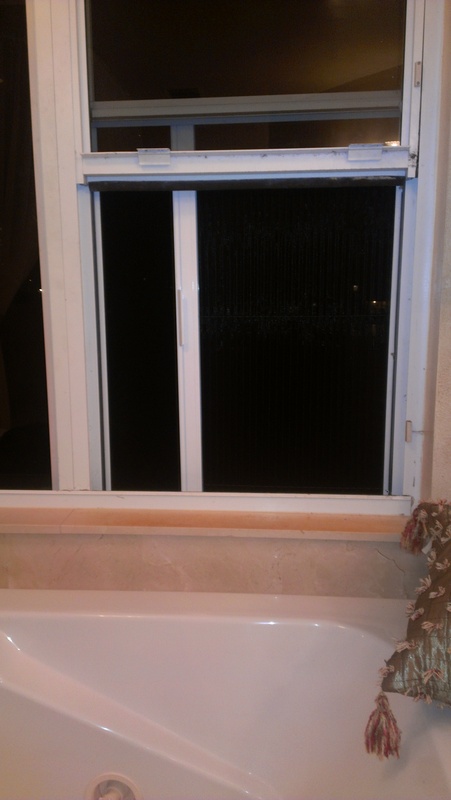 We also added a retractable screen in their bathroom right next to their bathtub that opened one way. 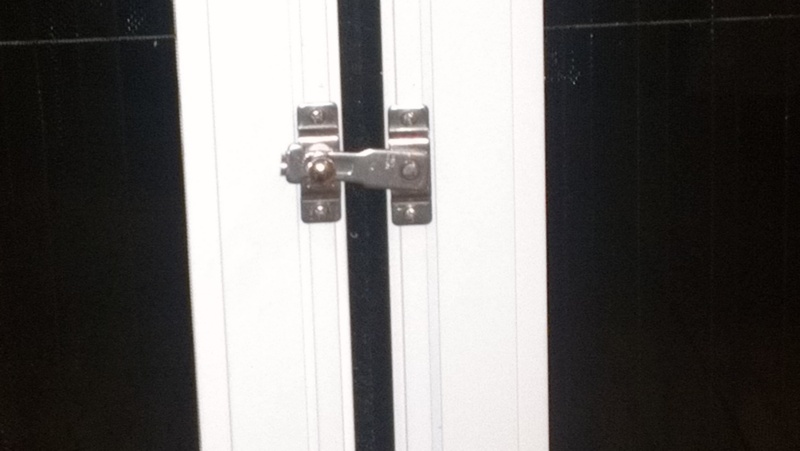 For the front door we included a locking latch to keep passersby from opening the screen door. 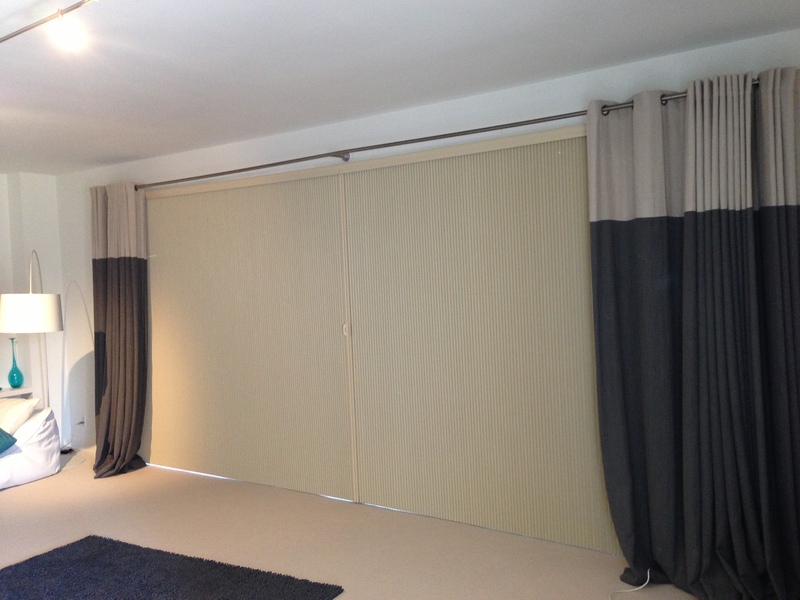 Our older clients had no problem opening and closing them due to the built in tension system. 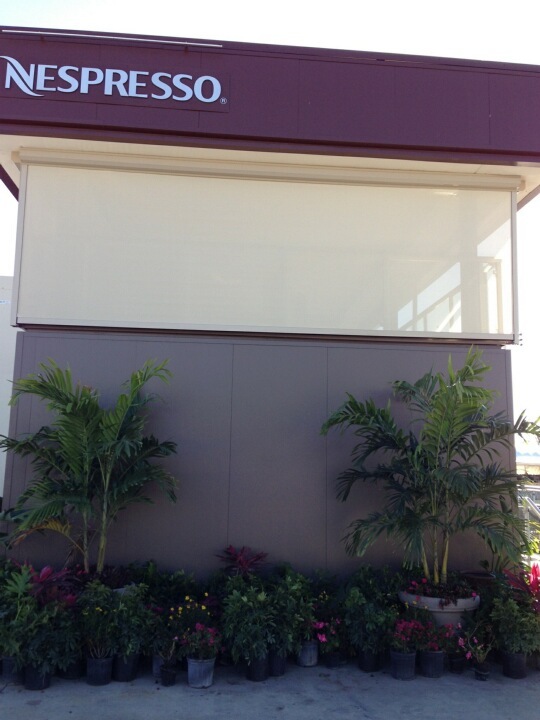 When open, these screens will give them a great breeze off the ocean while keeping those pesky bugs out. 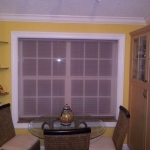 The Manta Ray Inn located at 1715 S Surf Road Hollywood, FL is our latest client to enjoy our Honeycomb Shade products. 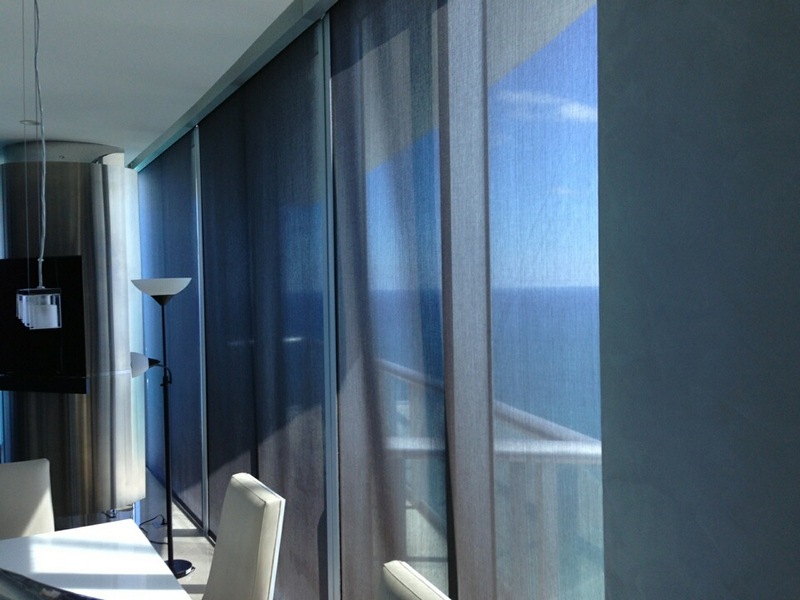 These quality shades are built in-house and can be produced in large quantities at an affordable price. 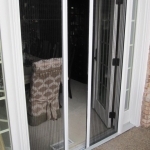 They are perfect for large remodeling projects and are easy to install and use! 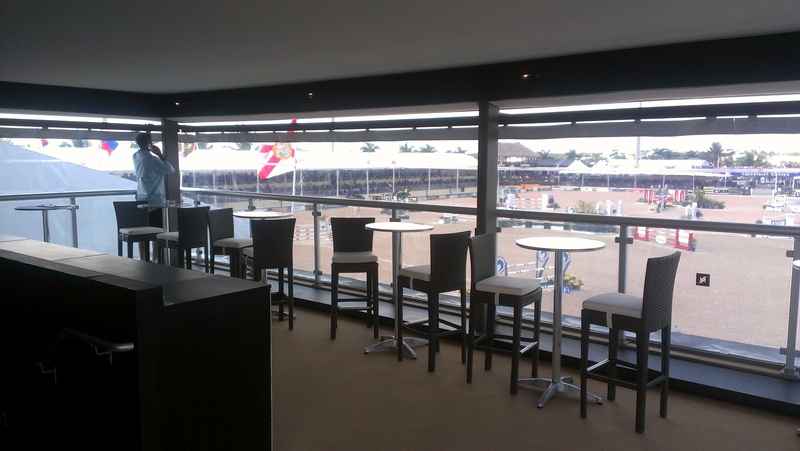 We used a number of different variations for this project including a top-down system for the doors on a tension system, and light filtered fabrics for the common areas on a continuous cord system. 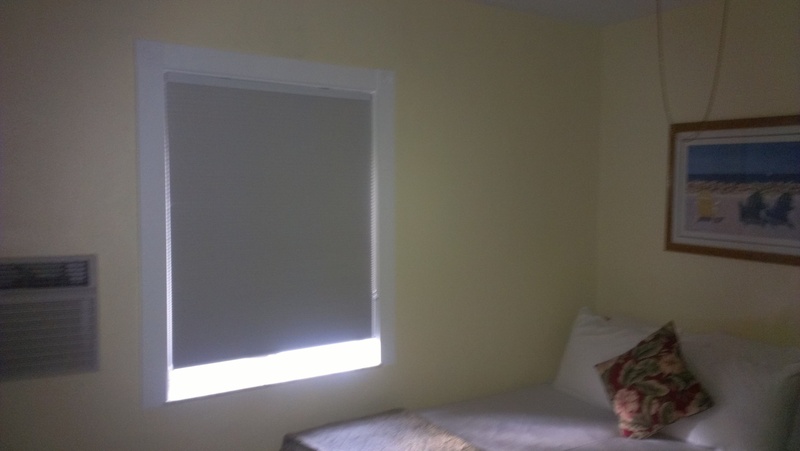 However, since the Manta Ray Inn is a vacation destination, its owners have decided to give each bedroom a black out fabric which prevents light from coming in. 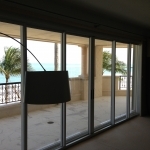 This way guests can relax and sleep at their own leisure. 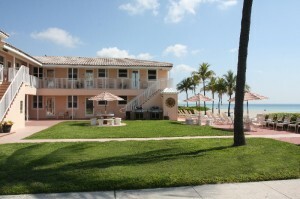 All the upgrades and remodeling has transformed the Manta Ray Inn from a charming ocean front inn to one of South Florida’s great beach vacation destinations. 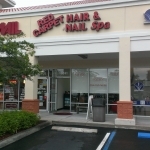 To learn more please visit their website at the link below. 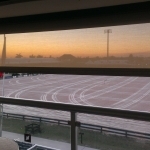 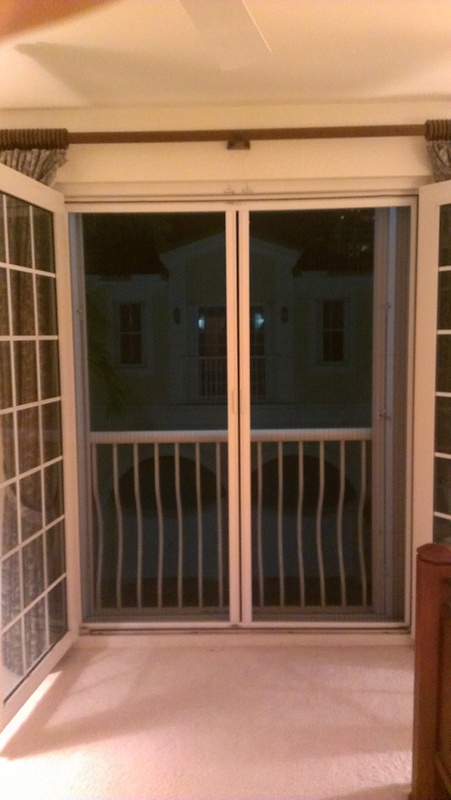 Retractable Screens, Our Newest Product is Getting Rave Reviews! 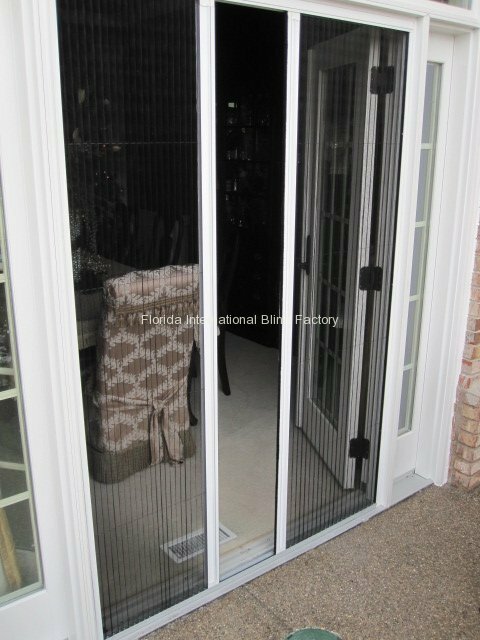 Due to the numerous requests from many of our clients we have come out with a new line of Retractable Screen Doors and Windows for the home. 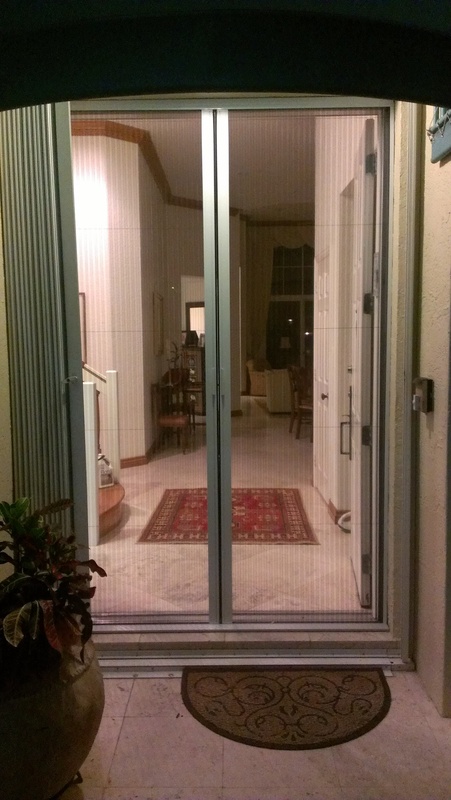 These are not your grandma’s screen doors either. 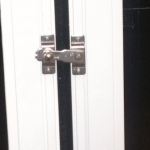 They work great and are easy to open and close. 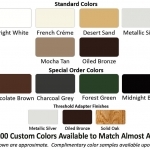 They also come in an assortment of colors that can match most home exteriors. 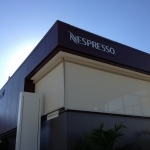 Please visit our Product Page to find out more. 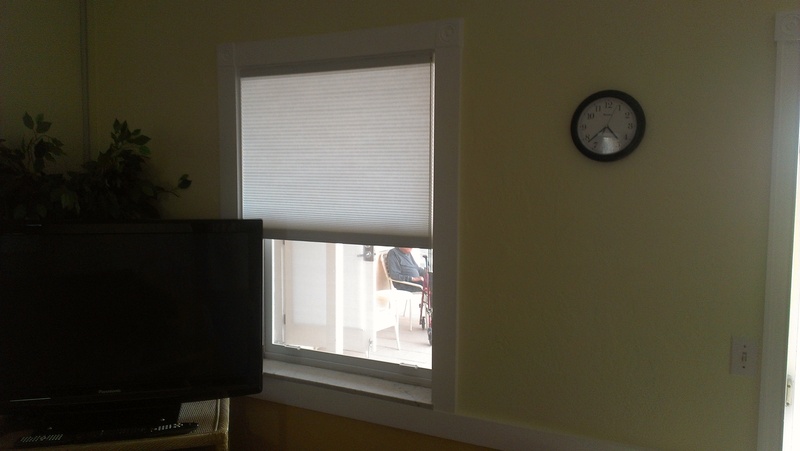 Posted in Residential Blinds	| Comments Off on Retractable Screens, Our Newest Product is Getting Rave Reviews! 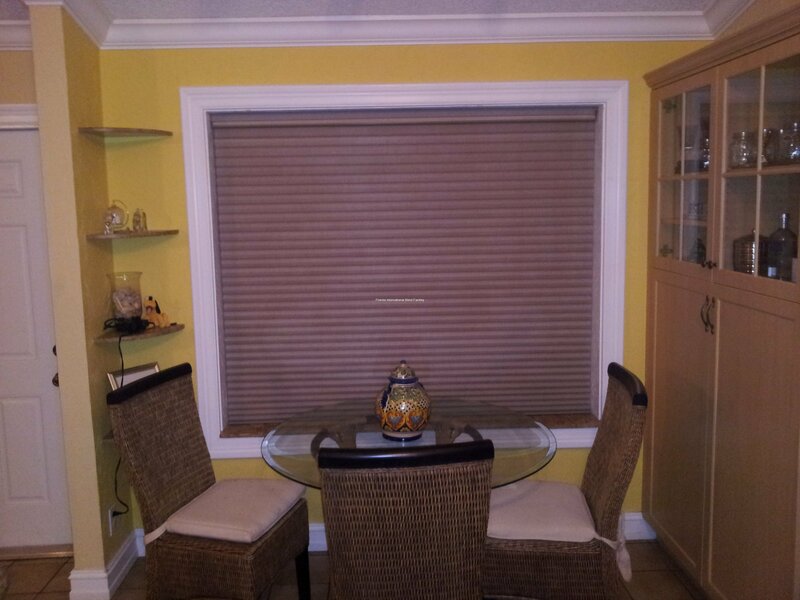 This was done for a client’s beautiful home in Weston, FL. 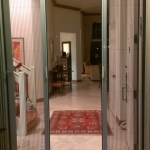 We motorized them so they can have an easy way to open and close them. 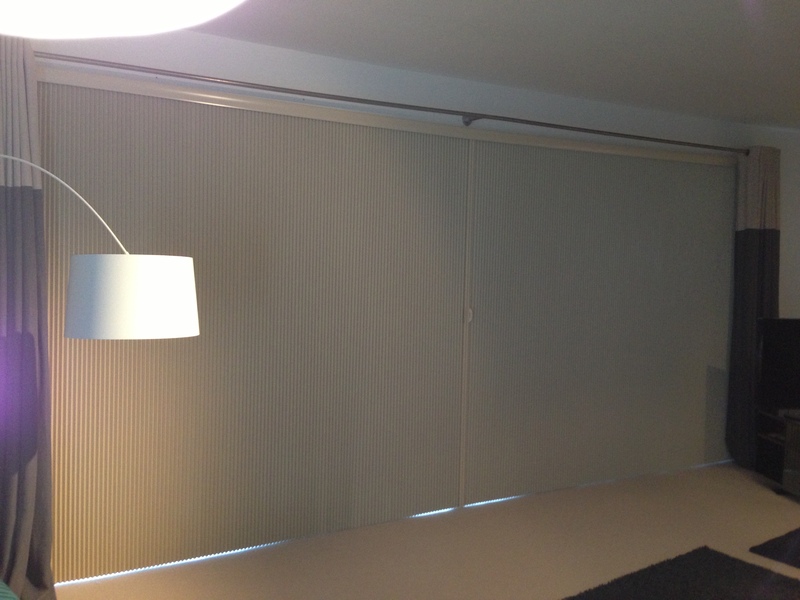 Motorizing blinds are great for any rooms where furniture or other obstacles would impede the normal mechanics of a non-motorized shade. 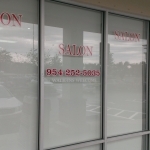 They can either be battery powered or powered through an electrical outlet. 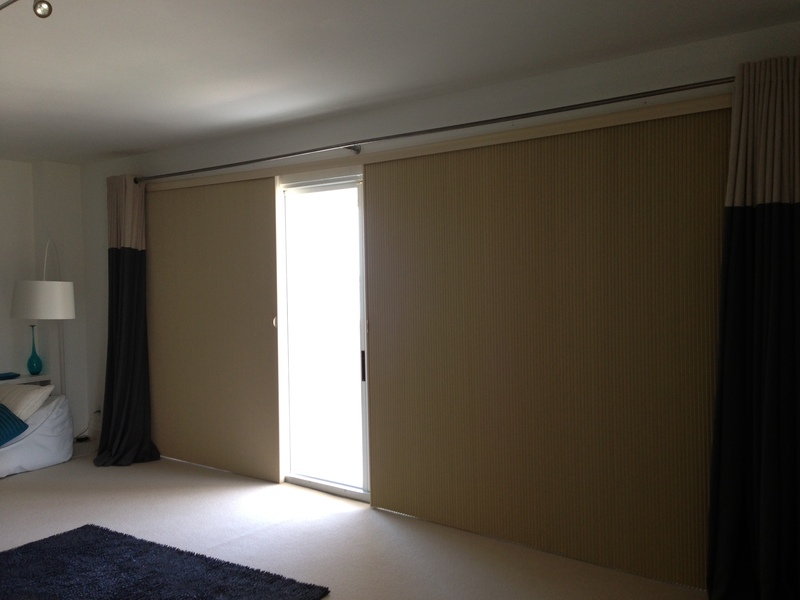 As you can see the client now has the ability to use both a light-filtered shade or a blackout shade that stops all light from entering the room making it perfect for any occasion. 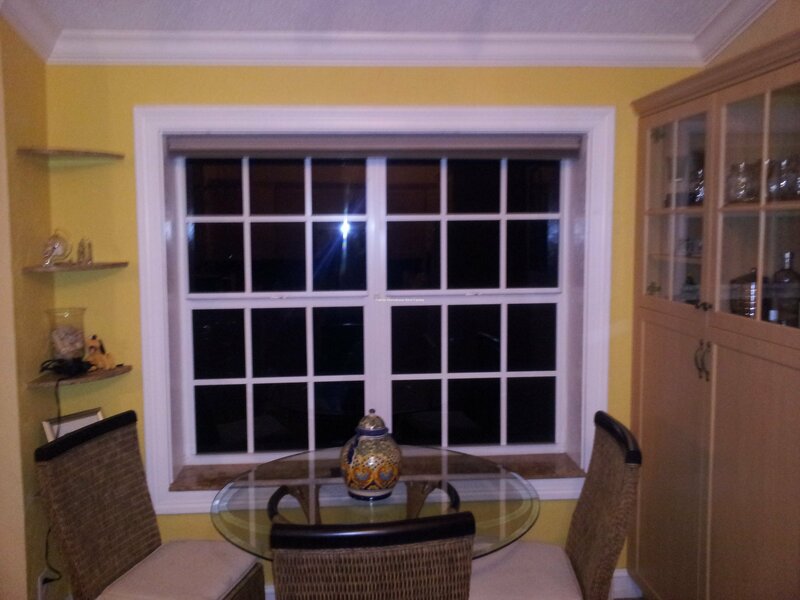 Notice how clean they look with no hanging cords or visible wires!